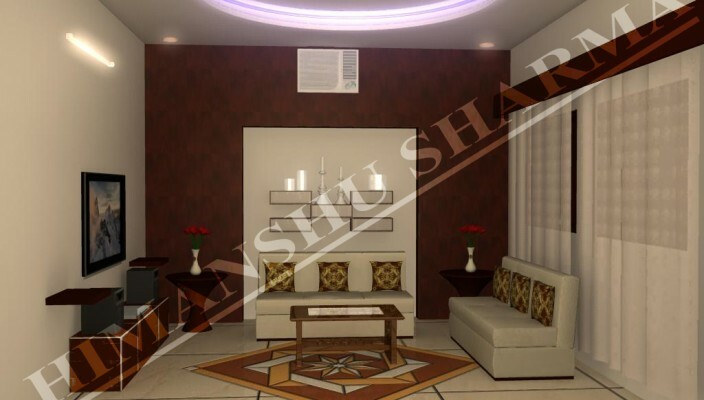 This design is about making the most of simplicity in traditional living rooms with limited furniture, designed floor of marble and restrained lighting. With the size of the living room getting smaller in modern homes, this design offers a theme that can set the mood right for the conversations. Simple and straightforward sitting arrangements with balanced furniture bring poise with the designed marble floor with a contrasting background. The use of light is limited to fall-ceiling and the wall, while the center table lacks any unwanted detailing with simple countertop. Ample space for adding required appliances, with shelves on one wall!